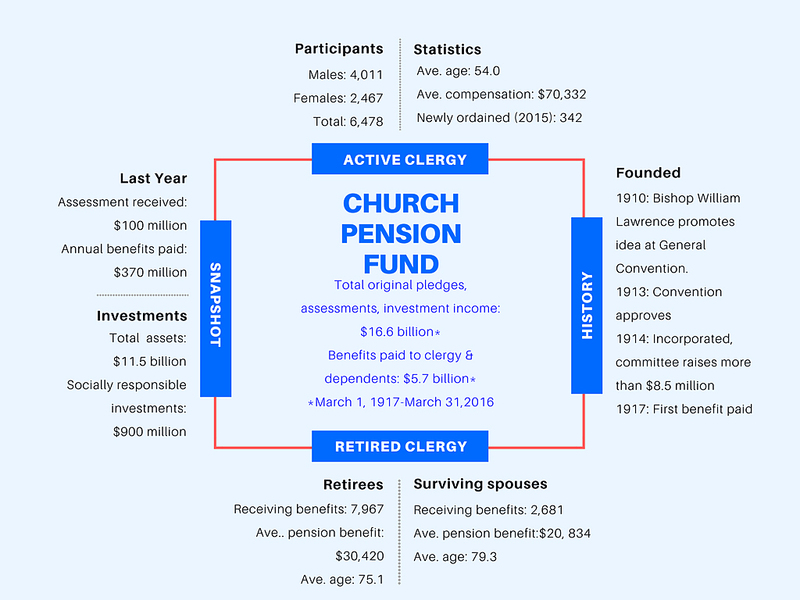 [Episcopal News Service] As the Church Pension Fund rounds its 100th anniversary year and enters a second century, many Episcopalians are considering how its ministry might need to change to serve a changing church. If the church’s “traditional” clergy employment model was a priest – always male until 1977 – employed full time with regular salary increases, who rarely interrupted his service or worked in the church after retirement, then only 58 percent of clergy now fit into that model, according to recent Pension Fund research. Sixty-one percent of those priests are male, 33 percent are female. A growing number of clergy typically work part time for multiple church employers over the course of their service. They often have some employment outside the church. Many clergy have their ministerial service interrupted for many different reasons. Their compensation does not necessarily increase over time. Many clerics continue to work after their retirement. In fact, 58 percent of retired clergy younger than 72 still serve in some capacity and 95 percent of retired vocational deacons do the same, giving many congregations clergy services they otherwise could not afford. The benefits landscape for Episcopal employees, lay and ordained, is also influenced by the continuing debate in the United States about the future of the Affordable Care Act and the disruption that the ensuing uncertainty has created in the insurance markets. “The reality of the church is that there are fewer people and, more than that, less money,” the Rev. Winnie Varghese, the Diocese of New York deputy who chairs the House of Deputies Committee on the State of the Church, recently told Episcopal News Service. The result, Varghese said, is a growing and more permanent class of part-time clergy and lay church workers. The committee is one group considering the question, in Varghese’s words, of whether the church has the structures it needs for the church as it is today, rather than the one it was 25 or even 10 years ago. Some changes already are set for next year when the Church Pension Fund plans to enact the biggest revisions to the fund’s benefits in the past 60-some years. Two important aspects of the clergy plan will not change in this round of revisions. The plan will remain a defined-benefit one and the mandatory assessment to which a cleric’s employer pays will remain at 18 percent. Staff members have spent more than three years traveling the church to listen to more than 1,500 Episcopalians discuss how the Pension Fund ought to react to the changing church. As CPG was listening to the church and discussing possible revisions, General Convention in 2015, via Resolution A177, approved the effort. In Resolution A181, it also told CPG to study compensation and the cost of benefits for clergy and lay employees in the dioceses of Province IX, the Diocese of Haiti, and the Episcopal Church in Cuba, as well as with its covenant partners. Staffers are winding down a tour of the church’s dioceses, both explaining the changes and, at times, tweaking them based on responses during those sessions. Meanwhile, House of Deputies President the Rev. Gay Clark Jennings has charged the State of the Church Committee to focus part of its triennial study on the Pension Fund, as well as on the church’s multicultural ministries and justice and advocacy ministries. Jennings told ENS that she chose those three aspects of the life of the church based on the concerns she has heard raised in her conversations with deputies and other leaders, and as she travels around the church. In July, the committee offered Episcopalians the chance to take two surveys, one about the Church Pension Fund and the other about social justice ministries. Nearly 1,200 people completed the Pension Fund survey. For instance, she said, the General Convention is concerned about parity for certain benefits between clergy and lay employees. But many clergy face years of debt for the education required to work in a church that does not pay for seminary education, she added. Paying off that debt sometimes influences priests’ employment decisions and their sense of financial security. Add to that the aforementioned changing financial and demographic circumstances. So, Varghese asked, hypothetically, does equity require raising all employees to the current benefit levels or does it mean reducing benefits for some in order to increase the level for others? And, who bears what pain of each of those choices? Based on questions and concerns raised in the responses to the July survey, the committee sent a set of questions to the Church Pension Fund. Wold told ENS in written replies to questions emailed to her that she worked with staffers and the Pension Fund’s board of trustees to respond. What Wold called a “very collaborative process” included videoconferences with the subcommittee working on the issue and follow-up questions from the subcommittee that eventually resulted in the fund’s 19-page response. When the Pension Fund sent its report to the State of the Church Committee late last month, it also released it to the entire church. The responses are part of the data that the State of the Church Committee is using to write its report. Normally such information requested by the committees charged with work in between General Convention is not released to the church ahead of the so-called Blue Book collection of official reports. Jennings told ENS that it is “a bit confusing” that the Pension Fund chose to release its responses without any context ahead of the committee’s Blue Book report. However, the State of the Church Committee is completing its report and it is due to be posted here early next year. One of the more interesting parts of the Pension Fund’s response involves its answer to the committee’s question of how it sees its relationship to the church. While noting the authority outlined in Canon I.8, the report describes the relationship as “transactional,” with the fund providing services to the church, which is described as a “client.” The fund says that it has “no legal or governance relationship” with the Domestic and Foreign Missionary Society (the name under which the Episcopal Church in incorporated). The Pension Fund suggests that the church can influence that relationship by the fact that General Convention elects 24 of the fund’s 25 trustees and can amend Canon I.8 to increase its services to the church. The most recent amendments came in 2009 when the convention told the Pension Fund to establish a mandatory lay pension plan and the Denominational Health Plan. The canonical relationship between the DFMS and the Church Pension Fund “is a subject about which reasonable people can disagree,” Jennings told ENS. The leaders of both organizations have had “thoughtful conversations about those issues and how General Convention might direct the Pension Fund to address contemporary realities and justice issues in the Episcopal Church, including the needs of part-time and non-stipendiary clergy and lay employees,” she added. Varghese said that questions about “the authority of General Convention with regard to everything and anything in the work of the Pension Fund” come up in many conversations at every one of the triennial gatherings. Part of those conversations involve whether the Pension Fund ought to have the same questions and concerns, and whether responding to them could make the pension fund more, or less, effective and financially sustainable. “The more that we can clarify that and be in the agreement, the better off the church,” Varghese said of the debates. The committee, she noted, cannot make any changes on its own. That authority rests with the General Convention and CPG. More information about the State of the Church Committee’s work is available here. Excellent report on the life long work of the Church Penson Fund and in understanding the kind of changes needed in our next 100 years. Is the clergy plan insured with the Pension Benefit Guaranty Corporation? In spite of numerous assurances on a recent CPG webinar that the plan remains viable, I remain skeptical that benefits that I am promised today will still be disbursed to me forty years from now.